Somebody may be reading this letter 80 years hence. And so, my friend (you pitying snob, I mean, who are holding this yellow paper in your hand in 1960,) save yourself the trouble of looking further; I know how pathetically trivial our small concerns would seem to you, & I will not let your eye profane them. No, I keep my news; you keep your compassion. Suffice it you to know, scoffer & ribald, that the little child is old & blind, now, & once more toothless; & the rest of us are shadows, these many, many years. This pattern of massaging the message and spin-doctoring holds throughout his life. Late in his career, he hired a clipping service, and today the files of the Mark Twain Papers at the University of California, Berkeley, are filled with the articles he was sent. Most of his interviews in Australasia and South Africa in 1895 through 1896 are known to scholarship only because newspaper clippings of them survive in his scrapbooks. In the course of his long career, Sam Clemens lost as many friends as he made. He did not suffer fools or rivals gladly, especially if they wore crinoline. He targeted them indiscriminately—from religious leaders (e.g., Mary Baker Eddy, John Alexander Dowie, De Witt Talmage), politicians (William McKinley, Theodore Roosevelt, Tim Sullivan), fellow writers and lecturers (Bret Harte, Kate Field), to literary pirates (John Camden Hotten) and military leaders (Frederick Funston). If Sam was often loved in public, he was sometimes loathed in private. He feuded for years with C. C. Duncan, the captain of the Quaker City, the ship that carried him and the other “innocents” to Europe and the Holy Land in 1867. Though he and James were both friends with Howells, neither of them could abide the other’s work. If Henry James was “the Master,” a careful craftsman who considered Sam’s writings vulgar, then Sam was the anti-James, an improvisational artist who, as he said, “would rather be damned to John Bunyan’s heaven than read” The Bostonians. He was not enslaved to the consecutiveness in writing which the rest of us try to keep chained to. That is, he wrote as he thought, and as all men think, without sequence, without an eye to what went before or should come after. If something beyond or beside what he was saying occurred to him, he invited it into his page, and made it as much at home there as the nature of it would suffer him. While Huck Finn is generally hailed as a great American novel, Sam also suffered his share of reverses and disasters. He was hardly exempt from the slings and arrows of outraged critics. He published his share of flops and potboilers, such as Merry Tales (1892), The American Claimant (1892), and Tom Sawyer Abroad (1894), all written when he was in the throes of financial exigency and imminent bankruptcy. All of these books clearly fall below the mark of his best writing. A consummate performer in his own right, he nevertheless cowrote with Bret Harte the play Ah Sin (1877), the most disastrous collaboration in the history of American letters. Ambitious to succeed, he was notoriously unwise in his investments, thinking the telephone a wildcat speculation while backing such inventions as a steam pulley, a carpet-pattern machine, and a powdered food supplement made from the albumin of eggs called plasmon. In short, he exhibited his share of human foibles, despite his modern reputation. On general principles it is a mistake to let anyone else write about Mark Twain, as long as we can prevent it … As soon as this is begun (writing about him at all, I mean) the Mark Twain that we have ‘preserved’—the Mark Twain that we knew, the traditional Mark Twain—will begin to fade and change, and with that process the Harper Mark Twain property will depreciate. In his introduction to a 1980 reprinting of the authorized biography, James M. Cox concludes unequivocally that Paine “acted as censor and custodian, doing all he could to preserve the life he had written and unhesitatingly denying would-be interpreters like DeVoto access to the papers.” Ironically, Paine appropriated some of Sam’s manuscripts for his personal use without permission and carelessly lost other documents, including the manuscript of his brother Orion’s autobiography. In the foreword to Mark Twain’s America (1932), DeVoto expressed scorn for Paine’s motives and methods. When he was starting to research his book, according to DeVoto, Paine “informed me that nothing more need ever be written about Mark Twain. The canon was established, and whatever biography or criticism had to say could be found in the six pounds of letterpress that composed Mr. Paine’s official Life.” DeVoto observed that the furor caused by Brooks’s thesis “rested on one marginal note quoted by Mr. Paine which accused [the primary scapegoat, Olivia Langdon Clemens] of steadily weakening the English language.” DeVoto eventually concluded, too, that Sam—not Livy or Howells or his other ostensible censors—“was responsible for many of the euphemisms and avoidances” in his writings. Paine delivered his patronizing reply in the preface to the Centenary Edition of Mark Twain: A Biography (1935): DeVoto seemed “a young man … more talented than exact” and “not always pleased with the facts as he finds them … The young man plainly was not pleased with Mark Twain’s choice of those to whom he trusted his literary effects—his daughter, Clara, and the writer of these lines.” Ironically, in 1935 DeVoto also began to contribute a popular column, “The Easy Chair,” to Harper’s Monthly, and in 1938, the year after Paine’s death, he was selected to succeed him as curator of the Mark Twain Papers. He remained in this office until 1946, and before his own death in 1955 he had received both a Pulitzer Prize for History and a National Book Award for Nonfiction. Nevertheless, Brooks’s contention that Sam had been crippled artistically by the censors who surrounded him, including his wife, editor Howells, and his friend Mary Mason Fairbanks, had the effect of fostering the false notion that “Mark Twain” was his alter ego or that he suffered from a multiple personality disorder like Dr. Jekyll and Mr. Hyde. Twain biography became and has remained a fertile field for psychoanalytically-inclined critics. In Freudian terms, if “the Wild Humorist of the Pacific Slope” (Twain) was the id, then the bourgeois family man who resided in a Victorian mansion (Clemens) was the superego. “The solution for critics … at least since Brooks,” according to Richard S. Lowry, has been to resolve the contradictions in his character “by literally dividing him in two.” Arthur G. Pettit alludes darkly to his “multiple personality.” Even DeVoto, Brooks’s most vocal opponent, conceded that “for a time” after the death of his wife and favorite daughter Sam “lived perilously close to the indefinable line between sanity and madness.” Paul Fatout epitomized this tendency toward armchair psychoanalysis when he tried to gauge precisely the “vague and shifting” line “where Clemens yields to Twain and vice versa,” as if there were “two persons occupying the same body,” which is exactly what Andrew Hoffman asserted in his biography Inventing Mark Twain as recently as 1997. Forrest G. Robinson flirts with the same notion by claiming that “the line separating Clemens from Twain was far from clear” even “to the man who bore those names,” though Robinson immediately qualifies his point by affirming the more conventional view: “Clemens was a historical person of many and complex dimensions, but there was only one of him. 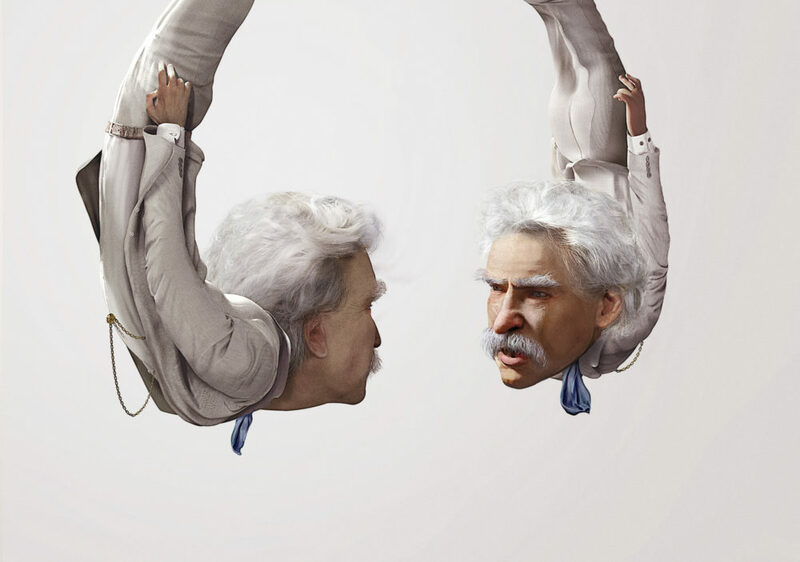 Mark Twain was a fiction of many and complex dimensions—not the least of them his relationship to his maker—but he was a fiction.” That is, his ego was more intact than many critics have been willing to grant. For decades after the publication of The Ordeal of Mark Twain, in short, Brooks’s thesis skewed the field of Clemens studies. In his 1930 Nobel Prize acceptance speech in Stockholm, Sinclair Lewis betrayed Brooks’s influence when he declared that Howells “was actually able to tame Mark Twain, perhaps the greatest of our writers, and to put that fiery old savage into an intellectual frock coat and top hat.” According to Justin Kaplan, he was “a double creature”: “The Hartford literary gentleman lived inside the sagebrush bohemian.” The very title of Kaplan’s Mr. Clemens and Mark Twain (1966), a play on Dr. Jekyll and Mr. Hyde, nods in Brooks’s direction, as does the milder common critical judgment that Sam was a welter of “contradictions” or “inconsistencies” sometimes verging on the pathological. To cite only a few examples: Gladys Bellamy (“Mark Twain seethed with contradictions”), Edward Wagenknecht (“There are contradictions in Mark Twain’s attitude about himself, as in everything else about him”), J. Stanley Mattson (“the contradictions in Mark Twain’s character were legion”), Fred Kaplan (“a man of many inconsistencies”), Joseph F. Goeke (“chronic vacillation, impulsiveness, and self-contradiction”), and Peter Krass (“a complex man who was almost schizophrenic”). Gregg Camfield avers that Sam’s “attitudes toward the world of commerce seem confused and contradictory,” particularly “the contradiction between his support of labor and his investment in a labor-supplanting machine.” He was an unabashedly countercultural figure—except when he was not. He also affirmed the standards of the social status quo—except when he did not. While he sometimes spoke truth to power, as when he condemned the depredations of the American military in Cuba and the Philippines during the Spanish-American War, he almost as often spoke what he considered truth to powerlessness, as when he sued a poor hack driver for overcharging his maid on a fare and justified his action on the ground of “civic duty.” He scorned hypocrisy, but he was vulnerable to accusations of hypocrisy in his own right. By the end of his life he had become both king and court jester, both Lear and the Fool. This essay is excerpted from The Life of Mark Twain: The Early Years. Published with permission of University of Missouri Press. Gary Scharnhorst is distinguished professor emeritus of English at the University of New Mexico. He is the author and editor of nearly fifty books, including Mark Twain on Potholes and Politics: Letters to the Editor. He lives in Albuquerque, New Mexico.